Hello, this is Brandi, from The Research Based Classroom. 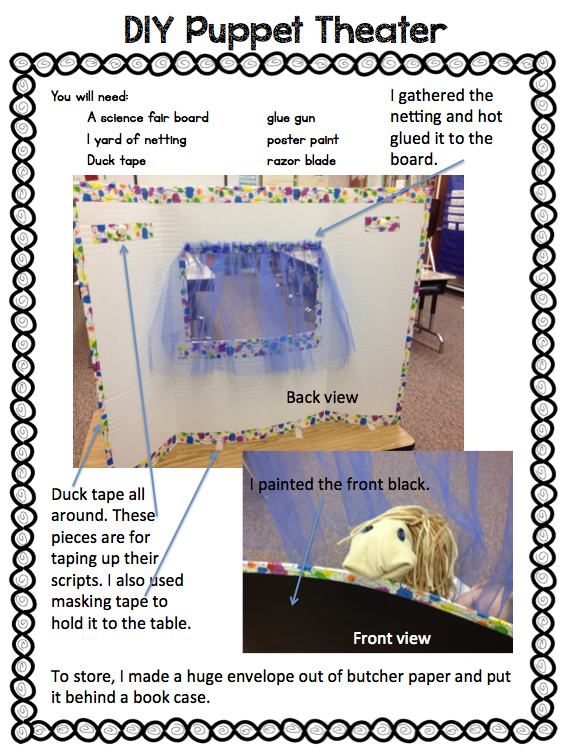 I've been putting together a unit of research, reading, writing and drama about Great Americans for my first grade class and created this DIY puppet theater for about $10. It was so quick, easy and best of all, reusable. It's perfect for allowing a little drama into the classroom. Net, duct tape and science fair board were almost $10 altogether. It is easy to get pushed over when the kids are using it, so use some masking tape and secure it to the floor, a desk or a table. By securing it where the duct tape is at, you won't have any damage when you take it down. To store, just make a large butcher paper envelope to hold it and put it behind a bookcase.